Objective: To determine if there is an association between focal and systemic bone loss in patients with RA. Methods: Bone loss is a hallmark finding in rheumatoid arthritis (RA) and manifests as localized, periarticular and systemic bone loss. RA patients were selected from the Consortium of Rheumatology Researchers of North America (CORRONA) database. Multiple logistic regression models were constructed to assess the association between the presence or absence of erosions and T-scores at the lumbar spine (LS) and total hips and adjusted for age, gender, body mass index (BMI), medications and disease activity indices. Results: Data on erosions and T-scores were available in 3,898 and 5,099 subjects, respectively. 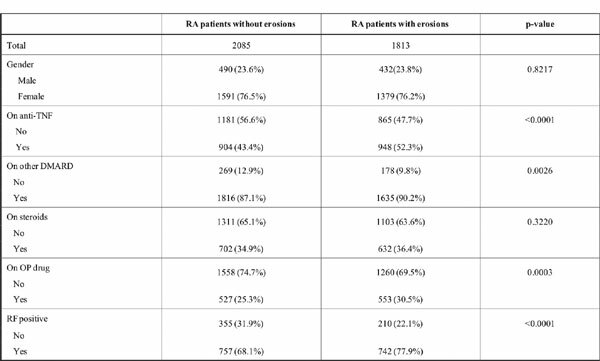 Patients with erosions had a significantly lower LS T-scores (-0.9) compared to RA patients without erosions (p=0.0002). Similarly, the mean total hip T-scores were significantly lower in patients with (-1.4) compared to subjects without erosions (-1.0) (p<0.01). The odds of having no erosion increased by 21% for each 1-unit increase in LS T-score and 46% for each 1 unit increase in hip Tscore. Patients with erosions were significantly younger (p<0.01) had a lower BMI (p<0.01) and higher DAS28 scores than those without erosions. More patients with erosions were on anti-TNF therapy, disease modifying drugs and osteoporosis medications than patients without erosions (p<0.01, 0.003 and 0.0003). Conclusion: RA patients with bone erosions have significantly lower T-scores at the LS and hips compared with RA patients without erosions. These data suggest a relationship between localized and generalized bone loss in RA. Keywords: Rheumatoid arthritis, Bone erosions, Osteoporosis, osteopenia, bone mineral density, osteoclasts. Keywords:Rheumatoid arthritis, Bone erosions, Osteoporosis, osteopenia, bone mineral density, osteoclasts. Abstract:Objective: To determine if there is an association between focal and systemic bone loss in patients with RA.